The following message is brought to you by every baseball season: Hey, dummy, don’t try to predict things. The Minnesota Twins are 28-18, tied for first place in the AL Central. The Oakland A’s are 17-32, giving them the worst record of any team but the Brewers. By third-order winning percentage — a team’s expected winning percentage, based on its underlying offensive and defensive performance, adjusted for opponent quality — the Twins should be 21-24, and the A’s should be 26-22. In a sense, that’s heartening: Those expected records aren’t too different from how the teams were projected to play before Opening Day. In another sense, it’s extra scary, a reminder that over a substantial percentage of a season, a winning club or a losing club can play like another team entirely by clustering high-leverage hits and outs in an unforeseeable fashion. Even when we’re dead-on, we can still be way off. The Royals’ and Padres’ first- and last-place ranks aren’t surprising, although the magnitude of the difference is larger than one might expect. In the current offensive environment, a difference of nine runs translates to one win, which means the gap between the Royals’ and Padres’ outfield gloves represents roughly four wins. I won’t insult you with an “on pace” line; a difference of four wins over a little more than a quarter of the schedule doesn’t imply that the difference will be 16 wins by the end of the season. But we can say that thus far, outfield defense alone has accounted for much of the difference — maybe most of the difference — between the first-place Royals and the mildly disappointing third-place Padres. These results don’t come as a complete surprise, because outfields are collections of individual outfielders, and individual outfielders have track records. In our World Series preview last season,1 I included this image of the K.C. outfield’s range from 2012 to 2014, relative to the average major league outfield’s. The blobs are the areas in which each group had a 50 percent chance to catch a ball that hung in the air for 3 to 4 seconds. 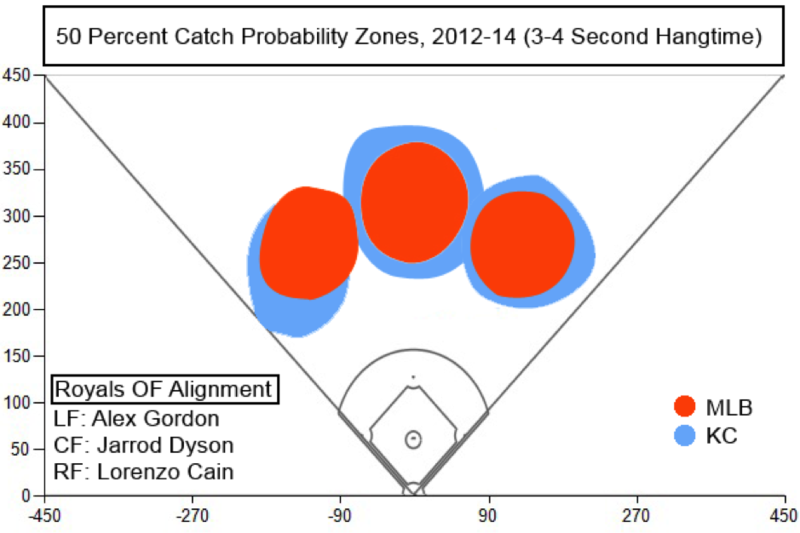 The blue blobs were bigger because the Royals had great range. And they brought their best fielders back, a year older but presumably still elite: Lorenzo Cain, Alex Gordon, and Jarrod Dyson returned for 2015, while Nori Aoki, the weakest link from 2014, signed with San Francisco. The Royals replaced Aoki with Alex Rios, whose defensive stats were shaky in 2013 and 2014, but Rios fractured his hand in April, which opened right field for Paulo Orlando. Orlando had the second-most Fielding Runs Above Average in Triple-A last season and has put up positive defensive stats in his small big league sample, although he’s about to lose playing time to Rios, who recently started a rehab assignment. The Padres, meanwhile, spent the winter pulling hitters out of hats, which worked, more or less: This season’s Padres non-pitchers rank in the middle of the pack in park-adjusted offense, an improvement over the back of the pack, where San Diego’s bats spent last season. To overhaul their lineup so quickly, though, the Padres had to neglect their gloves. GM A.J. Preller acquired the Dodgers’ Matt Kemp, who rated more than 20 runs below average last season by both DRS and UZR. Preller traded for Tampa Bay’s Wil Myers, a below-average right fielder, and made him the default center fielder, maybe the most consciously offense-first defensive assignment any team has executed since the Reds made a similar move with miscast center fielder Shin-Soo Choo in 2013.2 And Preller added Atlanta’s Justin Upton, who might have been deemed an average left fielder by someone in a generous mood. The stats say that so far Preller has gotten precisely the team he constructed: Will Venable, a holdover from the Josh Byrnes regime, is the only Padres outfielder with a positive DRS in 2015. By contrast, the only Royals outfielder with a negative DRS is usual first baseman Eric Hosmer, who played three spot-duty innings in right field Monday. The biggest difference — a swing of almost two wins — is in center, where Cain ranks first among all center fielders and Myers brings up the rear. We can visualize the difference with Bill Petti’s spray chart tool, which lets us plot all non-grounders in play3 allowed by Royals and Padres pitchers that have traveled at least 140 feet at a horizontal angle between -20 and 20 (where -45 and 45 represent the left- and right-field lines). Roughly speaking, these are balls that fall within the center fielder’s territory. Red dots are outs, gray dots are singles, and blue dots are doubles. The Royals’ staff allows more fly balls than the Padres’ — that’s a good thing, for both teams’ sakes — so the plotted points on the Padres’ display are slightly sparser. But there’s an even more obvious difference in results. The average center-field run value of Padres air balls in play is 12.2 per 100 BIP. For the Royals, it’s only 2.4 per 100 BIP. Higher values reflect better outcomes for the batting team; the Padres’ mark is one of the worst in baseball, while the Royals’ ranks as one of the best. And Royals pitchers must appreciate the help: Their 3.52 ERA outperforms their 4.05 FIP by the second-biggest margin in baseball, although that’s partly attributable to an above-average infield. Kansas City can pick it at every position. Padres and Royals pitchers have allowed almost the same average batted-ball velocity on line drives and fly balls in play, so hit hardness, at least, doesn’t appear to be a differentiating factor. Of course, these aren’t apples-to-apples environments: Kauffman Stadium is 410 to center, whereas Petco is only 396. That means Cain has more ground to cover than Myers. In fact, the Royals outfield as a whole has a tougher assignment: According to ESPN Stats & Info, Kauffman Stadium has the largest outfield area of any park, measuring 100,400 square feet. Petco Park’s well-earned reputation as a pitcher-friendly place owes more to the marine layer than to its open expanses, particularly after recent fence adjustments: Currently, Petco’s outfield encompasses a relatively cozy 92,400 square feet, making it the 17th-largest. Every part of Petco is smaller than the corresponding section of Kauffman, as the following square footages and MLB ranks reveal. The disparity in outfield environments makes it difficult to do a straight comparison of, say, triple-slash lines allowed, since Kauffman has more space for liners and fly balls to fall. In theory, DRS and UZR should account for these park effects. But we can get more granular than the overall ratings. UZR breaks its ratings down into Arm Runs, Range Runs, and Error Runs. The Royals are above average in everything, though they really excel at covering ground. The Padres are bad across the board. As one would expect, neither outfield has made an “impossible” play. Nor is there any difference between outfields in “almost certain” opportunities. The skill gap becomes clear in the intermediate difficulty levels. The Royals’ outfield has made “remote” plays 12.5 percent of the time, but the Padres’ outfield has yet to make one. The Royals have also made “unlikely” plays more than twice as often as the Padres, with large advantages in the “even” and likely” categories. The Royals’ completion percentages for “even” and “likely” plays are almost identical. You’re probably wondering what all of this looks like, so let’s take a look. The following field diagram contains the 10 best plays by the Royals’ outfield and the 10 worst plays by the Padres’, as determined by Baseball Info Solutions, based on location- and hang-time-based out probability. Padres plays are represented by beige boxes (we opted against camo); the Royals get blue boxes. Last year, Kansas City’s outfield led the majors at plus-46 DRS, while the Twins finished last at minus-50. The best and worst outfields of the 2003–14 DRS era are the 2013 Diamondbacks (plus-72, with one of the best DRS seasons ever in Gerardo Parra’s plus-36) and the 2010 Dodgers (minus-76, dragged down by an incredible minus-37 from Kemp), so this year’s leaders and trailers aren’t necessarily en route to something historic. Ironically, the Padres’ pitching staff’s biggest problem hasn’t been balls in play, but balls over the fence, which they’ve allowed more often than anyone else. Still, these outfields are stark enough contrasts to teach us something. The Royals haven’t regressed, and the Padres’ defenders haven’t proved anyone wrong. They’re a study in extremes, showing us one of baseball’s biggest defensive disparities and reminding us how much each out matters. The Inside Edge data in this article is current through Tuesday’s games. Thanks to Scott Spratt of Baseball Info Solutions, Kenny Kendrena and Keith Isley of Inside Edge, and Nick Wheatley-Schaller of Baseball Prospectus for research and graphics assistance. Choo was 17 runs worse than the average center fielder that season, according to both DRS and UZR. In other words, all line drives, fly balls, and pop-ups, excluding home runs. You can find these figures at FanGraphs, but the numbers there won’t match up perfectly, since they don’t incorporate the latest reviews and tweaks on Inside Edge’s end. Inside Edge’s play ratings don’t account for the fielder’s starting spot. A request for Statcast defensive data on the Royals and Padres went unanswered.